"RandomLine, Inc. was created in 2002 by a dad who loves to play, John Kiely. His goal is to offer products that encourage children to be creative and use their imagination. No Noise. No Batteries. Simply Imagination is RandomLine’s motto.While sitting in New Jersey traffic during his hour commute to and from work, he had the idea to create a game based on doodling. He created a prototype of his first game called SQUIGGLE®. Kiely decided to use his12 years of consumer product & packaging development experience and expertise in industrial design to start his own company.After attending the 2003 American International Toy Fair in New York with his new product, he established his first big customer, Wizards of the Coast. Since then, RandomLine has successfully created and launched a line of games and activity pads that can be found in over 2000 toy stores, gift shops, museums, zoos and aquariums, as well as Canada and New Zeland and Europe.Kiely receives a lot of support from his two children who help test his products and ideas. Besides helping with testing, his children are his inspiration. Kiely’s wife also assists in the business as she brings over 16 years of marketing experience in the educational publishing industry." Alphabet SQUIGGLE game is a unique, educational board game that introduces letters to children in a fun and creative way. Kids will learn and improve letter recognition and handwriting while strengthening their vocabulary and building self esteem. Children who are just learning letters to those who already know them will enjoy playing this fun and engaging game. Watch how surprised they get when they see how much they can do with letters!To Play: Players move along the pencil path of letters. For every letter a player lands on, that player must find the letter on the outside edge of the board and either trace it or write it from memory on the sketch paper provided. If they're feeling creative, they can turn their letter tracing into a picture, write a word that begins with that letter, or create a drawing that begins with and reinforces that letter to move extra spaces. It’s simple, fun and engaging. 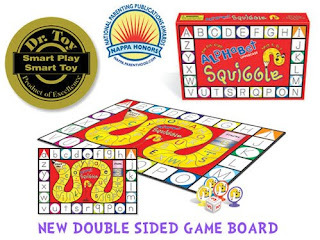 Alphabet SQUIGGLE board game is a Dr. Toy Smart Play/Smart Toy Award Winner and recently won a National Parenting Publications Honors Award (NAPPA)!" What we thought: The kiddos love this game! A really enjoys playing and even though she knows how to print her letters, this gives her a fun way to practice them. I'm excited to get D interested in writing letters as well, even though he is barely 2. Alphabet Squiggle was fun for our whole family. We have played it several times for our review and each time has been a blast. We are really looking forward to playing it with A's same-age cousins...I'm sure everyone will love it! We are huge fans of games and if they can incorporate education in a fun way, they get a thumbs up from us:) ABCD Diaries gives Aplhabet Squiggle an A+!! Buy It: Find this fun-filled learning game at Barnes & Noble or Toys R Us or check the store listing for a retailer near you! Win It: RandomLine Games has generously offered one ABCD Diaries reader their very own Alphabet Squiggle Game! To enter, tell us who you'd play this game with! Disclosure: ABCD Diaries was given a Alphabet Squiggle game for review purposes only. We were in no other way compensated. The opinions expressed in this post are ours and ours alone. I would play this game with my son. Following Randomline games on twitter. I would play with my kiddos and Hubby! I'd play this with my nephew. my daughter will be 4 in December so I would play with her! I would play this game with my little guy. I would play this game with my seven-year-old. I would play this game with the kids that I babysit. We are always looking for new games that they all can play, thanks for the giveaway! I subscribe through google homepage RSS feed, thanks! I'm a google friend connect follower (kconklin1028), thanks! I entered your Lunchbox Reviews giveaway, thanks! I entered your Little Green Books giveaway, thanks! I entered your powermat giveaway, thanks! I also entered the personalized ornament giveaway. Also entered the Little Green Book giveaway. Also entered the Mrs. Cubbinson giveaway. Entered the Family Dinner Cookbook giveaway. Entered the Wehrhouse flower pillow giveaway. My 3yo little girl would love to play this with her big sis! I entered the toothbrush sanitizer giveaway. I entered the holiday wreath giveaway. I entered the childrens book giveaway. I entered the personalized ornament giveaway. i can't wait to play games with my daughter! i'd save this for her birthday this spring because by then she should be starting to understand easy games. I would play this game with my nephew! I'd play this with my kids. I would play this game with my friend's son. I'm following RandomLineGames on Twitter (ps152). I entered the Mrs. Renfro's giveaway. I entered the Mrs. Cubbison's giveaway. I entered the Hershey's giveaway. I entered the Family Dinner cookbook giveaway. I entered the Yo Gabba Gabba giveaway. I would play this game with both of my kids ages 5&6. I Follow ABCD Diaries via Google Friend Connect. I entered the Mrs. Cubbisons giveaway. I entered the Dewey Nine Lives giveaway. I entered the Corner Art giveaway. I would play this game with my niece! I am following via Google Friend Connect Entry#1. I am following via Google Friend Connect Entry#2. I would play it with my kids.